The great expectations that arose after the Stockholm Agreement on the Yemeni crisis adopted in Sweden in December have crumbled, and the country is again standing “on the edge of an abyss”, in the words of local observers. The situation in Yemen dominated talks held by US Secretary of State Mike Pompeo during his recent tour of the Middle East, especially in Saudi Arabia and the United Arab Emirates. The US Embassy in Riyadh released a statement confirming Yemen was at the top of Pompeo’s talks with Saudi King Salman bin Abdul-Aziz, Crown Prince Mohamed bin Salman, and Minister of State for Foreign Affairs Adel Al-Jubeir. Pompeo told King Salman that he was grateful for Riyadh’s support for the Yemeni political process under the sponsorship of the UN. With Bin Salman, the US secretary of state “agreed on [the] need for continued de-escalation and adherence to [the] Sweden Agreement” between the internationally recognised government of Yemen and the Houthi rebels, especially in the port city of Hodaida in the west of Yemen. “A comprehensive political solution is the only way to end the conflict,” the US Embassy statement said. However, despite the 13 December Agreement signed in Stockholm between the Yemeni government and the Houthis to monitor the ceasefire in Hodaida and the pullout of militia forces, and the fact that the UN Security Council voted unanimously on 21 December to authorise the deployment of UN monitors to observe the implementation of the agreement, fighting has since broken out again between the two warring parties amid the Houthis’ rejection of a UN monitoring mission. Head of the Houthi delegation Mohamed Abdel-Salam requested the removal of retired Dutch general Patrick Cammaert, chairman of the UN monitoring mission in charge of overseeing the ceasefire in Hodaida. “The lack of progress in Hodaida in terms of the implementation of the Stockholm Agreement is mainly due to [Cammaert] who has steered from the course of the agreement by implementing other agendas,” Abdel-Salam said. “The task seems to be greater than Cammaert’s capabilities, and it’s going to be difficult to discuss other issues if UN Special Envoy to Yemen Martin Griffiths does not intervene to address the matter,” he added. The Houthis want Cammaert out of the picture because he has not recognised the redeployment procedures in Hodaida the group announced at the end of December. However, the situation has also been complicated by the decision by Yemeni President Abd Rabbu Mansour Hadi to lift emergency levels on the fighting fronts following a Houthi drone attack on the strategic Al-Anad airbase last week. Chief of Yemen’s Military Intelligence Saleh Tamah died of the wounds he suffered in the drone attack on a military parade in the southern Lahj province. 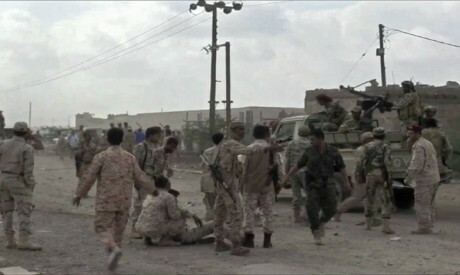 A number of army commanders were wounded in the attack, including army Chief of Staff Abdullah Al-Nakhi. The international community condemned the attack, and Griffiths said it had come at a time when hopes were high to further advance negotiations aimed at ending the war. Al-Anad is the largest military airbase in Yemen, taken by the Houthis in their march southwards towards Aden in 2015. Government forces took back Al-Anad later in the same year. Yemen has been plunged into deepening poverty since the onset of the war that flared when the Houthis overthrew the country’s internationally recognised government in mid-2014. In response, President Hadi requested Saudi Arabia’s support to fight the Houthis. Since then, Saudi Arabia and the UAE have engaged in a war against the Iran-backed Houthis, according to statements made by Riyadh and Abu Dhabi. The Houthis and Tehran have denied Iranian backing. According to UN estimates, 6,800 civilians have died and 10,700 have been injured in the war. Tens of thousands of children’s deaths could have been avoided if it were not for malnutrition and the spread of diseases such as cholera, in addition to the deterioration of healthcare services across the country, according to observers. In November, UN Secretary-General António Guterres warned that if the international community did not work towards ending the conflict in Yemen, 14 million people — approximately half the population — could be lost to famine in the following months. The UN said humanitarian conditions in Yemen were the worst the world has seen in decades. Yemeni politician Mohamed Al-Mikhlafi said the Houthis were the cause of the deterioration in Yemen and that they realised that their redeployment or withdrawal from Hodaida would prevent them from monopolising the entrance of food, medicine and fuel supplies to the country. Yemen has been importing food, medicine and fuel for years, most of which enter through the port of Hodaida, the lifeline of the country. Al-Mikhlafi accused the Houthis of stealing humanitarian supplies and trading in them at the expense of the lives of the Yemeni people. The UN World Food Programme has threatened to suspend deliveries, saying that the Houthis were stealing aid “from the mouths of hungry people” and accusing them of “criminal behaviour” and of selling aid on the black market. The Houthis have claimed to have refused the entry of the programme’s food into the country because it was “rotten” and “violates standards and regulations for human consumption”. Saudi Ambassador in Yemen Mohamed Al-Gaber said that 60 per cent of the humanitarian aid sent by the coalition countries did not reach the Yemeni people because of the Houthis. The Associated Press has also published a report saying that the warring parties on both sides of the conflict have prevented humanitarian aid from reaching the Yemeni people. Al-Mikhlafi believes the Houthis must now implement the Stockholm Agreement since it is the only way out of the crisis in Yemen. “Implementing the deal according to their own interpretation of it won’t cut it. Continuing to fight will not last for long. And the international community won’t tolerate famine in Yemen,” he said. In response, the Houthis have accused the government and coalition forces of wanting to control Hodaida in order to monopolise “the aid the Yemenis receive”. The Stockholm Agreement states that the UN will monitor the port of Hodaida to ensure the delivery of humanitarian aid to the Yemeni people and that the port should be evacuated of all warring forces. The government and the Saudi-led Arab coalition have agreed to the terms of the Stockholm Agreement, whereas the Houthis fear the loss of one of their most important military cards since the eruption of the war.